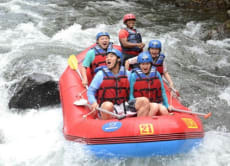 At Telaga Waja River Rafting Adventures we wish to offer people the most enjoyable the longest available rafting track 18 km and safe adventure experiences in Bali. We reborn since 1 June 2018 after fullly renovated with allmost 3 hours the real rafting fun adventures on the river without any steps up at ending point to get restaurant and car parking area. We spare no expense when it comes to your safety and comfort with state-of-the art, top-of-the-line equipment. More importantly, not only are our excellent guides are some of the most experienced white water guides in Bali, but quite fun and humorous too! Pick-up, sanding, rafting, the guide and food are all good. But the course was too short than the contract. It took 1.5 hours to finish the course. But it had to take at least 2.5 hour from the contract. The tour was really fun, it was about 3 hours of rafting to get to the bottom. All in all a very nice experience. A couple of things I didnt like, it never gets really intense so dont expect a life threatning rush of adrenaline, and we rested 3 timea for about 20 min each. Way too much resting. The staff was really nice and is always joking around and having fun which was good. Great adventure, amazing experience. Tried to book some others but I understood that it will be great to do this rafting in telaga waja. So we did. If you can add breakfast it will be much better. Thanks to the team for such arrangement. Appreciate you. Amazing Experience. The landscape around is incredibly beautiful and would advice to any one taking this tour. Everything worked perfectly well. This was my second time rafting in my life. I thought I would never have more exciting experience when I had the first one but this was more than amazing! I really enjoyed slope of white water. Also, I didn't have to row so hard because the water flowed strong. And thanks to Voyagin, I reserved the same program for cheaper price compared to other members I did rafting with.